The kind of lavish, rousing historical adventure spectacle that doesn’t seem to exist anymore, Khartoum is a majestic, star-studded, BAFTA and Oscar-nominated epic that finds director Basil Deardon (Victim, The Assassination Bureau) delivering a feast for the eyes, as well as a pointed study of English colonialism, religious fanaticism, and the nature of heroism and sacrifice. In 1880s Sudan, thousands of British-led Egyptian troops are massacred by the forces of Arab fanatic Muhammad Ahmad (Laurence Olivier), who believes he is the Mahdi, and nothing less than Mohammed’s chosen warrior in battling against Anglo-Egyptian rule. Legendary Major General Charles George Gordon (Charlton Heston) is sent by Prime Minister William Gladstone (Ralph Richardson) to save the city of Khartoum from the Mahdi, but given only one aide (Richard Johnson), limited support from the British government that sent him there, and a fearless opponent determined to create a new empire, Gordon sees that further bloodshed is imminent. 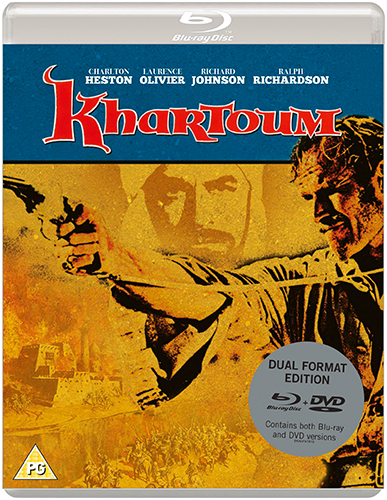 With impressive battle sequences given greater weight by philosophical and moral debates about the righteousness of military action, Khartoum is a widescreen extravaganza and was the final film to be shot using Ultra Panavision 70 (and screened theatrically in Cinerama) until Quentin Tarantino’s The Hateful Eight in 2015.